The locally-owned Iowa Barnstormers are committed to building strong relationships and strong communities. 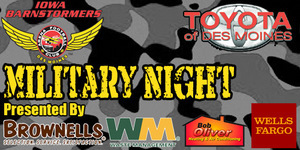 This July 1, help the Barnstormers honor those who have dedicated their lives to defending our country. Businesses, organizations, and individuals can purchase tickets to the July 1 Barnstormers game which will be distributed to Iowa service men and women, veterans, and their families. Look at the packagesbelow to find out how you can help! -Listing in Barnstormers game program, "Storm Watch"
-Listing in the Barnstormers game program "Storm Watch"